ICD-10 is a system for medical diagnosis and procedure coding for care management and billing purposes that went into effect on October 1, 2015. It impacts every system, process and transaction that contains or uses a diagnosis or procedure code. 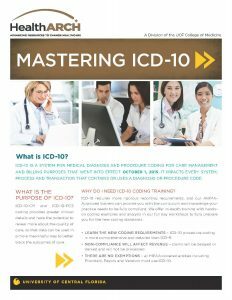 WHY DO I NEED ICD-10 CODING TRAINING? ICD-10 requires more rigorous reporting requirements, and our AHIMA-Approved trainers can provide you with the curriculum and knowledge your practice needs to be fully compliant. We offer in-depth training with hands-on coding examples and analysis in our full day workshops to fully prepare you for the new coding standards. We offer full day face-to-face training workshops. These comprehensive sessions will address everything you need to know about implementation critical to billing guidelines, codes and structure for ICD-10-CM or ICD-10-PCS. Designed for a more personalized learning experience, these small classes offer hands-on learning with opportunities to practice coding scenarios. Manuals, workbooks and a flash drive of additional materials are all provided. WHICH WORKSHOP DO I NEED? This workshop is for entry-level coders and front desk personnel to develop basic coding skills including understanding the coding structure and key search terms. This workshop is for coding professionals who are active coders. It covers changes in the structure of ICD-10-CM and an in-depth approach to understanding the new guidelines, conventions, diagnostic, and chapter-specific body systems as well as practicing coding scenarios. This workshop encompasses ICD-10-CM guidelines, conventions, diagnostic, and chapter-specific body system coding. It covers clinical documentation and specificity required by physicians. This workshop is for inpatient hospital coding and covers body system, root operation, body part, approach, device and qualifier sections. On-Site Customized Specialty ICD-10 Training is available. Please contact us for more information.